Disclosure that he ignored advice in congratulating Putin suggests staff dismay. WASHINGTON — President Trump and some aides were furious Wednesday after the leak of sensitive notes for briefing the president before a call with Russian President Vladimir Putin, according to aides and a close associate. 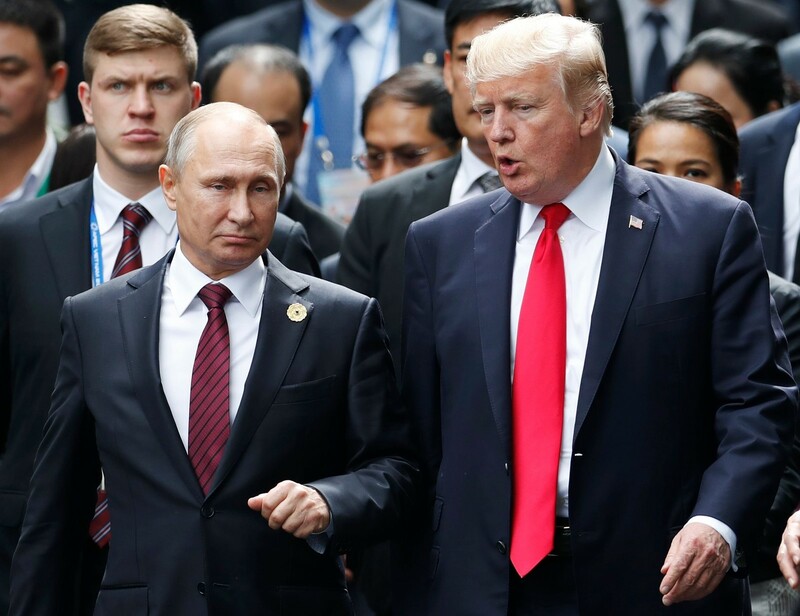 Trump spoke with Putin on Tuesday and was criticized afterward, including by Republican lawmakers, for congratulating the Russian leader on his reelection Sunday. The president did so despite widespread outrage, including among other administration officials, asserting that Putin’s government has subverted democracy in Russia, continues to try to disrupt U.S. elections, is committing atrocities in Syria and recently carried out an assassination attempt in Britain using a military-grade nerve agent. The Washington Post reported late Tuesday, citing unnamed officials, that Trump ignored a warning in his briefing materials, written in capital letters, that said, “DO NOT CONGRATULATE.” It is unclear whether the president saw the material, sources said. Leaking such materials is an extraordinary step, given the level of sensitivity in contacts between the president and a foreign leader, especially a geopolitical rival. The disclosure about the Putin call, however, is especially fraught, underscoring Trump’s much-criticized insistence on warm relations with Putin despite national security concerns, as well as the president’s own political and legal vulnerability amid a special counsel’s investigation of Russia’s election interference. Trump faced similar but far less consequential embarrassments early in his term after the leak of transcripts of his confrontational calls with two allies, Mexican President Enrique Peña Nieto and Australian Prime Minister Malcolm Turnbull. Those leaks seemed intended to portray Trump as naive and undiplomatic. One person who speaks regularly with White House officials said the most recent leak seemed particularly geared toward “infantilizing” Trump, who has ignored numerous suggestions that he rebuke Putin. White House Chief of Staff John F. Kelly also is said to be infuriated — “on a warpath,” according to the person in close contact with national security officials. The leak further undercuts Kelly, who since arriving last summer has sought to bring more order to the White House and ensure that Trump has high-quality briefing material. People with knowledge of how the White House operates said the number of people who see Trump’s briefing materials is relatively small, perhaps 12 to 20, depending on the topic. They cautioned, however, that a wider circle could have learned that information secondhand. Trump also noted that Obama congratulated Putin after the Russian’s 2012 election, which at the time elicited some criticism. Yet the circumstances were different. Russia had yet to annex Crimea, further intervene in Ukraine, a U.S. ally, commit alleged atrocities in Syria and seek to disrupt U.S. elections as drastically as in 2016. Many in the national security community want a tougher public approach from Trump, however, and think Putin has gotten the better of the relationship.